Miami Valley Career Technology Center student ambassadors for the 2018-19 school year from Darke County are (back row, l-r) Jordan Rhoades, heating, ventilation and air conditioning student from Franklin Monroe; Nathan Mescher, heavy equipment operator student from Versailles; Carter Ward, graphic commercial art student from Ansonia; Kirsten Zink, dental assistant student from Franklin Monroe; Megan Rinderle, medical lab assisting student from Versailles; (front row, l-r) Emma Price, cosmetology student from Tri-Village; Allen Christman, biotechnology student from Ansonia; Amanda Jeffers, pre-nursing student from Mississinawa Valley; Trinity Konwiczka, natural resource management student from Mississinawa Valley; and Olivia Keihl, business ownership student from Arcanum. 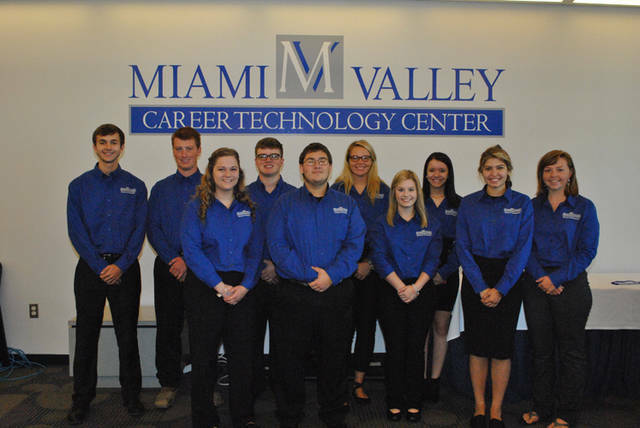 ENGLEWOOD – The Miami Valley Career Technology Center has 44 senior students who will serve as student ambassadors during the 2018-19 school year. These students learn leadership skills and public speaking to represent MVCTC as spokespersons for the school. The MVCTC student ambassadors visit the 27 MVCTC partner school districts in the fall to share their experiences, career technical programs and career goals with high school sophomores. All of the sophomores from the 27 partner schools have the opportunity to select two career programs to visit at MVCTC during the annual Sophomore Career Days in November. For more information about Sophomore Career Days or visiting MVCTC, call 937-854-8056. For more than 45 years, MVCTC has provided career technical education for 27 partner school districts encompassing five counties, including Darke, Miami, Montgomery, Preble and Warren counties. MVCTC is dedicated to providing in-demand workforce training for youth, adults and organizations in the Miami Valley.